Creel self catering holiday cottage is a detached single story, renovated barn, which has just been modernised. 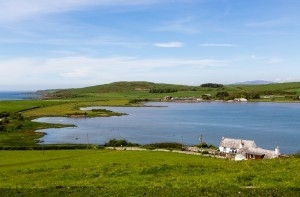 Creel cottage sleeps upto four, accepts pets and is situated on the coast with uninterrupted views out across the Ross Bay. Creel cottage is a comfortable cosy cottage sleeping up to four, with a Dowling multifuel burning stove and central heating. The open plan L shaped kitchen/ lounge/dining area has leather settees, flat screen TV with DVD player, WIFI, and a lovely oak dining table and four chairs, with some DVDs, board games, toys, books and magazines. There is a Dowling “Firebug” multifuel burning stove for which we will provide kindling, wood or coal for those cosy nights inside with that relaxing toasty feeling. There is a well equipped kitchen with, quality cutlery, glasses, bowls serving dishes, ample crockery along with microwave, coffee maker, and modern black dishwasher, washing machine and a fridge/freezer. There is a fan assisted oven with electric hob, extractor fan, DeLongi matching kettle and four slice toaster, and coffee maker. 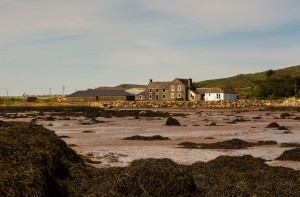 You can prepare a tasty dish with the view of the sea, and sound of the waves as the tide rolls in towards Creel Cottage. Imagine the French doors open, sea air blowing as you enjoy a glass of wine on the balcony (whilst watching the children play on the beach). There is also a delightful, private, enclosed garden to the rear with flagged patio area, BBQ and seating. For alfresco dining (balcony, beach or rear patio) there is a selection of unbreakable plates, glasses et cetera. For the kitchen we provide a “just in case you forget” box including dishwasher tablets, washing machine sachets, dishcloths, washing up liquid, tea towels, some tea, coffee, sugar, kitchen roll, cling film, kitchen foil, and we are happy to receive an Asda/Tesco delivery for you prior to your arrival. There are two bedrooms, a double room, and a twin room (two single beds) with contemporary Laura Ashley design, décor and locally sourced finishing touches for a quality restful nights sleep. Soft bedlinen, all season tog duvets available to suit your comforts and requirements, with additional blankets, and luxurious mattress toppers. The bathroom comprises of a toilet, wash hand basin, electric shaving point, a bath where you can relax a while, and an overhead invigorating shower. There is an electric fan heater and electric towel rail. We provide a “just in case you forget” box with some hand wash, shower gel, bath soak, shampoo, conditioner, and toilet roll. 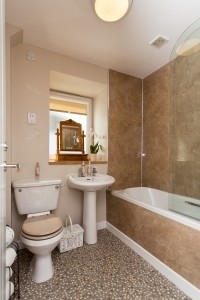 Bath and hand towels are provided along with a bath mat. Kirkcudbright, known as the artists town, Castle Douglas known as the food town or Wigtown known as the book town all provide intrigue and interest for all the family. On arrival you will be greeted by either some complementary handmade chocolates, homemade cupcakes, chocolate fudge cake, Victoria Sponge with fresh cream and strawberries, and a warm kettle to kick start your relaxing break. From the lounge / dining area you can gaze out at the sea by day and the stars by night, contemplating what to explore first, the rockpools across the lane, beachcombing, the woodlands on the hill, wildlife, sea fishing (bring your own tackle and boat!) or the best loved local towns. Kirkcudbright, known as the artists town, Castle Douglas known as the food town or Wigtown known as the book town all provide intrigue and interest for all the family. There is ample parking next to Creel cottage, along with an enclosed garden to the rear, housing a small wooden lockable shed. A small well behaved dog is welcome, along with its own bedding, lead and towel for drying dirty sandy/muddy paws after having fun! If there is anything additional you may require or would like to know please give me a call or email and I will see what I can do to try and accommodate your requests. We can also offer vouchers should you wish to gift a stay or a voucher of any value towards a stay at Creel Cottage to a loved one or friend who deserves a fantastic treat. Please just email or call me to discuss. For more information please visit our website at www.rossbayretreat.com online availability and booking system. 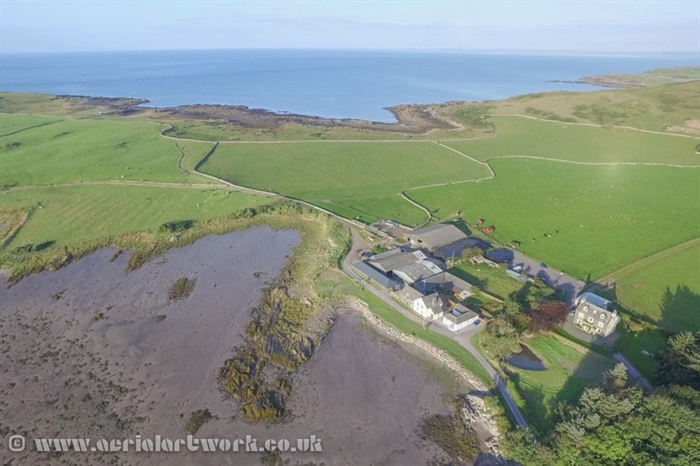 Creel cottage and Dairy House from the air. 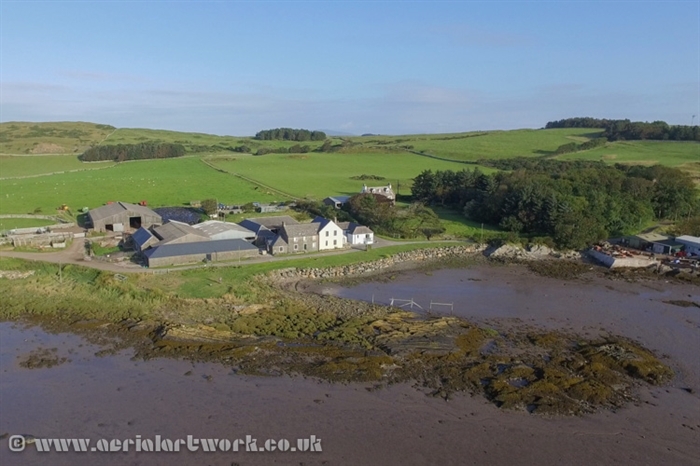 Creel cottage and Dairy House from the air.